Image: "Tommy" Ryan is pictured in the Melbourne premiership team of 1900, courtesy of demonwiki. There were a few players named Ryan playing for the Blues at this time. Unfortunately most of their first names are not known. The Herald had an article on new players for the coming season and Ryan's name appears in the item. 1891 Ryan was playing with the Britannia Football Club. April 13 1895 and Carlton played Richmond in a pre season match on the Richmond City Reserve, behind the Richmond Town Hall. T. Ryan was named in the Carlton team and he kicked one the Blues' 6 goals in Carlton's victory. In the following weeks Carlton played junior clubs Alberton and then the Carlton Juniors, however match details of these games are few. Origins of Australian Football Vol. 5 has T. Ryan playing his only senior match on May 09 1896 against Essendon at East Melbourne. 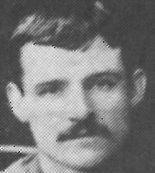 According to demonwiki, the Melbourne history web site, ( www.demonwiki.org ), Jeremiah "Tommy" Ryan was at Melbourne from 1899 - 1903, playing 55 games and kicking 63 goals, he played in Melbourne's 1900 premiership team. He was then cleared to St. Kilda in 1904 and played 11 games. Contributors to this page: blueycarlton , Jarusa and pblue . Page last modified on Monday 11 of December, 2017 15:23:56 AEDT by blueycarlton. 2003 - Jim Buckley; already a Hero (Mar 03).